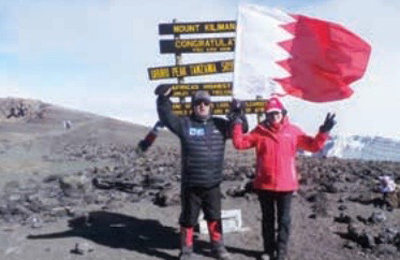 A Bahraini who suffers from Parkinson's disease has made it to the top of Mount Kilimanjaro, in Tanzania, for the second time in just over a year. Businessman Ahmed Jaffer, 59, climbed 5,895 metres to reach the summit of Mount Kilimanjaro, which is the highest point in Africa and the tallest free-standing mountain in the world, said a report in the Gulf Daily News (GDN), our sister publication. The expedition was one of many adventures he has embarked on around the world after learning that physical exercise can improve the condition of Parkinson's patients. “This time I was ready to face the challenges at each stage of the adventure,” he told the GDN. “I was also more active and faster. “However, the weather was rainy which made it harder to climb. “Weather changed while climbing as well and it was like we went through the year's four seasons in the 10 days of the hike. “My challenge was my health condition and I think that I have proved that it can be improved by determination and daily training. “According to doctors, exercise can help improve a Parkinson's patient's condition because it develops more muscles. “I choose this treatment or method as a way of life. Since being diagnosed with the illness five years ago, Mr Jaffer has also sailed past icebergs in Antarctica and ridden horseback in Mongolia. He received international recognition in Austria in January as a result of his brave approach to confronting the illness, as well as his role in spreading global awareness - helping others overcome the shock of being diagnosed and encouraging patients to feel comfortable with their condition. He was named Ambassador for Parkinson's Affairs and Relationships by the Austrian Parkinson's Self-Help Group during a ceremony in Vienna. Joining him on his second trip to Kilimanjaro was International Non-Olympic University national brand ambassador Shaikha Noora bint Khalifa Al Khalifa. The 27-year-old said she was inspired by Mr Jaffer's courage and his determination to fight the disease. “This is my first adventure of this kind, which I did to encourage all Parkinson's patients to try something different and challenge themselves,” she said. “I was inspired by Jaffer and his courage to do such an adventure at his age and despite his health condition. “The experience was not easy at all, but the challenge made it very entertaining. “My biggest challenge was breathing because oxygen decreases as we go up, but thank God we made it to the top. “I wanted to support the cause of spreading awareness of how important physical activity is for Parkinson's patients. “Until now the disease has no cure and can only improve by physiotherapy, which is why Mr Jaffer chose to fight it by embarking on expeditions that include strong muscle efforts. Shaikha Noora also revealed that a society to care for Parkinson's patients in Bahrain was being set up. “We are in the first phase of establishing a society that cares for Parkinson's patients and gives them the awareness they need on how to improve their condition,” she said.